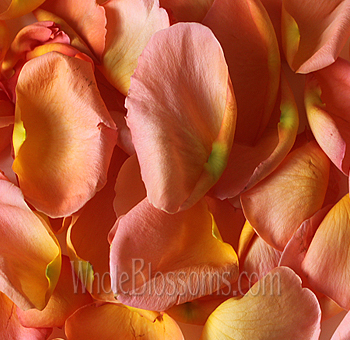 Rose petals are a popular seller for weddings and special events. We offer fresh, freeze dried, and organic. Choose from a wide array of different colors and year round availability. There is a long standing tradition for their use in weddings. Gaining in popularity, they have recently been recognized for their relatively long shelf life and suggested use at some venues. 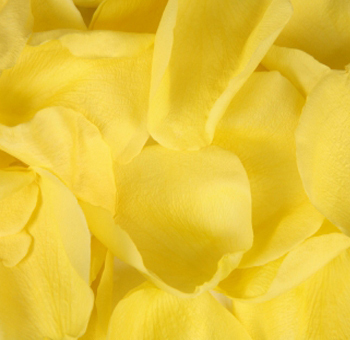 Its non-slip attribute and strong anti-stain properties have helped propel them to recognition with many florists, and event planners. Finally, they are available in limited colors and quantities. 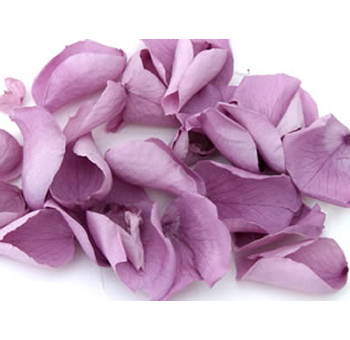 Grown and produced at certified organic farms, fresh organic rose petals satisfy the concerns for the environment and demand for naturally grown alternatives. Roses have and will always be the most used and loved flowers. There's something about roses, the colors, the fragrance, the fact that it's edible which will always attract people towards it. 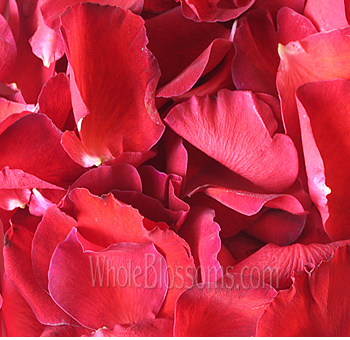 Today roses and even rose petals are extensively used everywhere. From special occasions, holidays and even weddings. 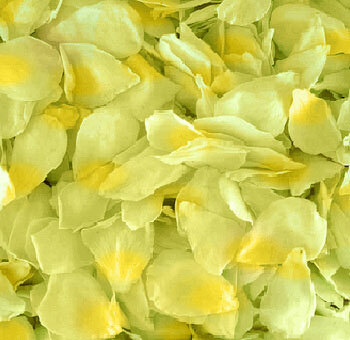 The uses of this fantastic flower and its petals are varied. They are not only used for ornamental purposes but also in the beauty and culinary industry. 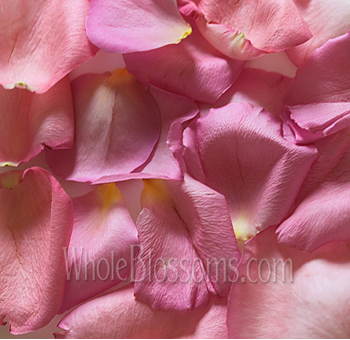 Rose petals can be candies, and they make gorgeous garnishes on some delicacies. 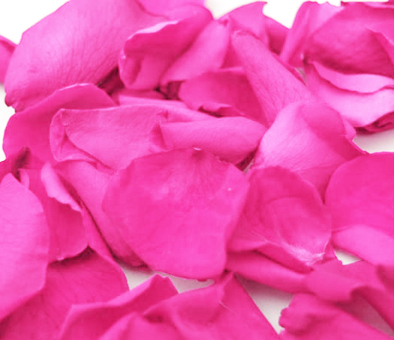 The beauty industry too has exploited its uses and devolved cosmetics with rose essence in it. 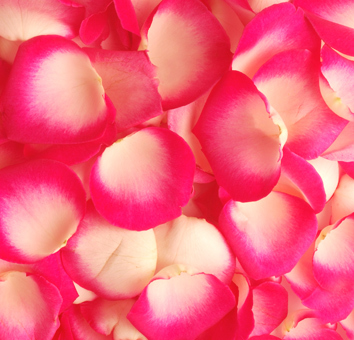 Rose petals come in different colors. 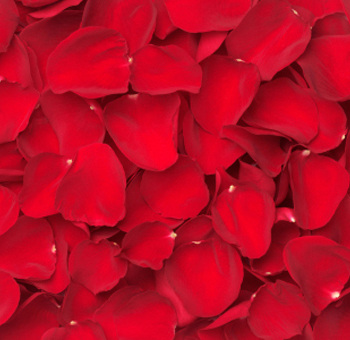 So, when you think rose petals you don't necessarily have to stick with red. 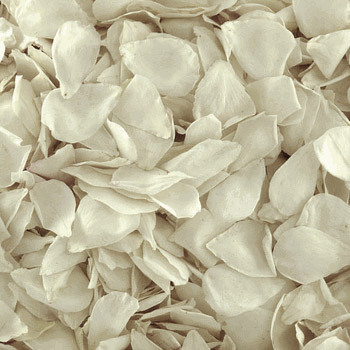 White rose petals are especially prevalent when it comes to wedding décor. 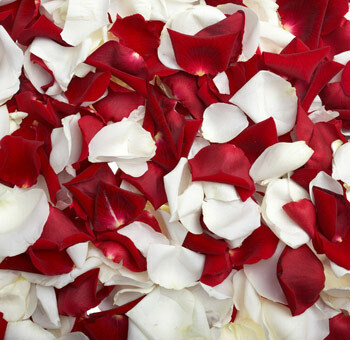 Red rose petals, and pink rose petals are hugely used in special events and holidays like Valentine's Day. The rose in itself stands for beauty, grace and everlasting love. No other flower can represent these meanings better. 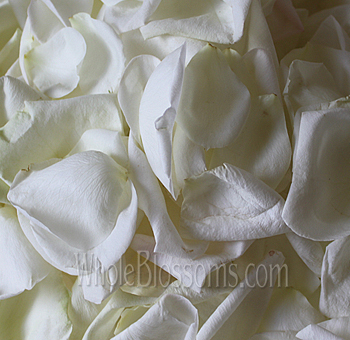 Rose petals have a charm of their own. They are readily available everywhere, and you might want to purchase in bulk. 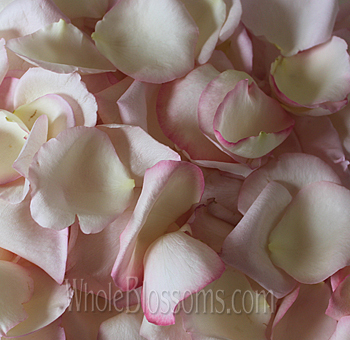 Rose petals can be used almost any and everywhere. So, buying in bulk will also give you the freedom to be more creative. Make sure that you’re rose petals are fresh. Roses dry and out and take on a brown tinge which is not pleasing at all. 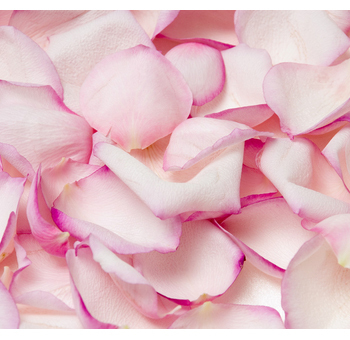 Your fresh rose petals should easily last you at least 3-4 days. 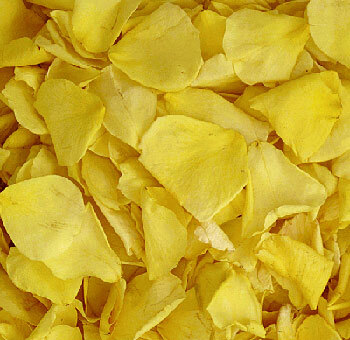 You can find them easily at Rose petals florists. But we suggest that you purchase them directly from wholesalers. You'll not only save a ton of money, but you might have more options to choose from too. 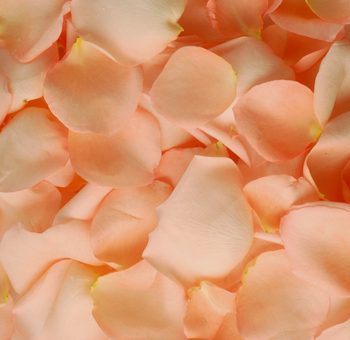 Rose petals are used to add the perfect finishing touch to the wedding décor. Mesmerizing and charming they can be used by flower girl or just on the wedding aisle. The flower girls basket can be filled with petals which she can throw around as she walks down the aisle. This is traditional, and rose petals are the classic choice. They look beautiful even when sprinkled across your wedding tables or reception tables. They can even be added to centerpieces. 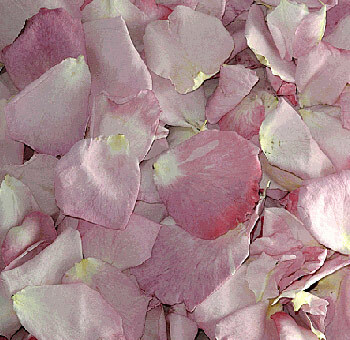 When it comes to a wedding, it can't go wrong with rose petals. 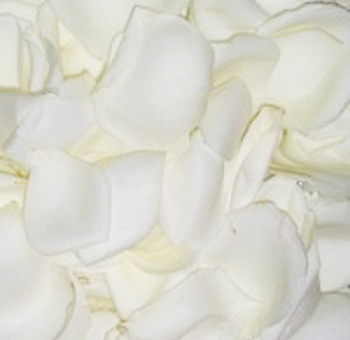 Mostly rose petals are used when the bride and groom exit the reception. It's used as confetti which makes for stunning pictures and lets your guests participate in the celebration too. 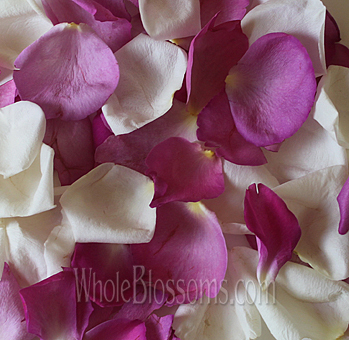 This is the most common way of using rose petals. But apparently, there are more fun and unique ways to use them. Like for example in wedding invites. Your wedding invitation sets the tone for the day of your wedding. Your cards match your wedding décor theme and so on. You can place some rose petals in your invites, and we're sure your guests would be in for a delightful surprise when they open them. 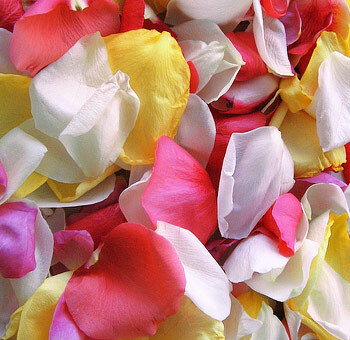 You can use rose petals according to your wedding colors and give out a hint of your theme too! 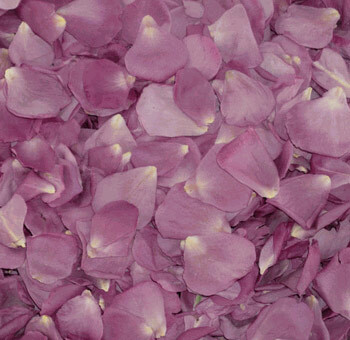 Rose petals look stunning down the wedding aisle. If there are no flower girls, you can always opt to scatter them around. It's very popular to scatter rose petals down the wedding aisle, but we suggest that you be more creative and make runners or shapes, edges, petal carpets or your initials with them. You can ask the ushers to seat the guests from the outside to not ruin your aisle before your walk. Designs like these down the wedding aisle manage to make it look very stunning. Rose petals on table settings is also a wonderful idea. It gives off a very romantic and magical vibe. 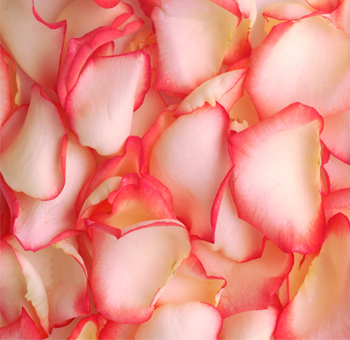 The whole décor can be transformed by just scattering a few rose petals around. The trendiest thing you can do it’s use lanterns covered with rose petals. Paper lanterns with rose petals will create a very pretty and whimsical décor and can be used to decorate the wedding ceremony or the reception. 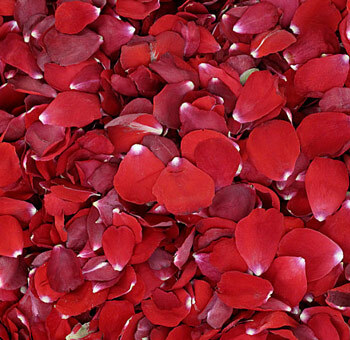 Strings of rose petals can be made into magnificent backdrops or photo ops for you and your guests. All you have to do its string rose petals on cotton of r finishing line. They are very delicate, and you can even play around with colors. 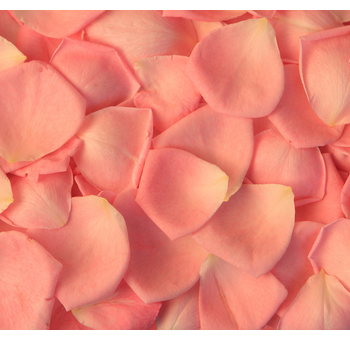 If you do plan to use rose petals in your wedding décor or for any special occasion that you’re planning you will need them in bulk. Since there are so many ways to use them you will also need the freedom to be creative. 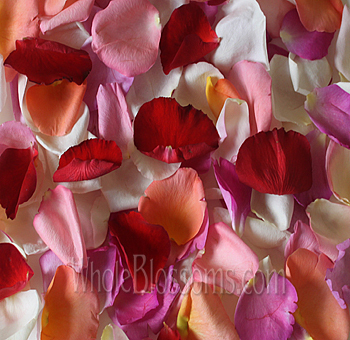 A large number of rose petals can let you experiment like that. Wholesalers are the best option for this. It will help you save money and stay under budget too! 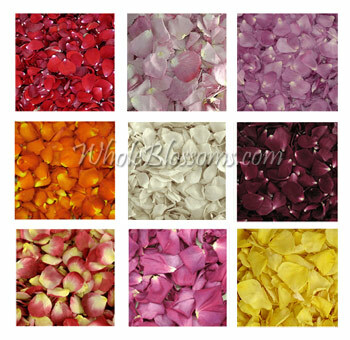 Many wholesalers provide with rose petals for sale online. There are many colors available too. However, you have to ensure that they are fresh and reasonable. Whole Blossoms is one such trusted online wholesaler. 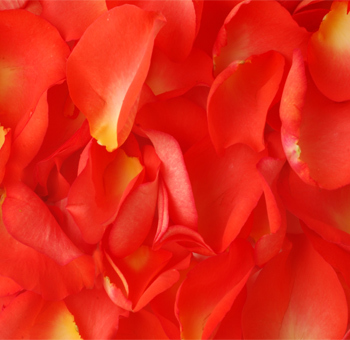 They can not only provide you with rose petals but also cater to all your flower needs. They have a 24/7 delivery system that delivers fresh cut flowers right at your doorstep! This can be a lifesaver for event planners or even do it yourself brides. 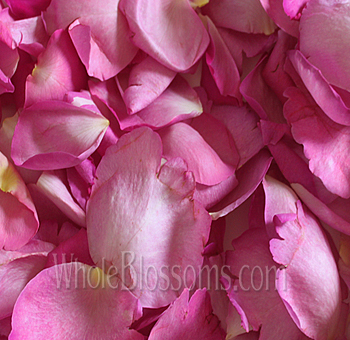 Your fresh rose petals are just a click away!